Four members of Lulzsec in the U.K. have been sentenced for their role in attacks on Nintendo, Sony, Bethesda, the CIA and other companies and agencies. Back in July 2011, members of the Lulzsec collective dared - I mean, literally dared - the authorities to arrest them. So the authorities did. There's probably a lesson about pride and falls in there somewhere, or maybe just about not shooting your mouth off and motivating the other team, but that's the sort of education that comes too late to do any good. Two of them pleaded guilty in June 2012, while two others initially decided to stand behind their tweet and fight the power but later changed their minds. Now, almost a year after the first pleas were entered, sentences have been handed down and just about everybody is going to jail. Ryan Cleary, who provided the software that was used in the attacks but was apparently not a "core member" of Lulzsec, was sentenced to 32 months and faces additional jail time for hacking U.S. Air Force computers and possessing "indecent images of babies and children." Jake Davis, credited as the Lulzsec "press secretary," was given two years; Ryan Ackroyd, the "ringleader," will be jailed for 30 months; and Mustafa al-Bassam, who posted stolen information online, escaped with a 20-month suspended sentence. "This is not about young immature men messing about," Prosecutor Sandip Patel said. "They are at the cutting edge of a contemporary and emerging species of criminal offender known as a cybercriminal." 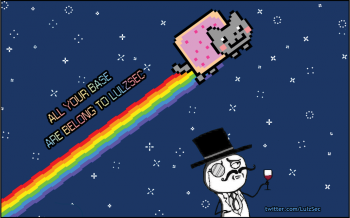 Lulzsec went on a short but spectacular rampage in 2011 before announcing in June of that year that it was disbanding. Unfortunately for all involved, that was right around the time that the FBI busted Hector Xavier Monsegur, also known as Sabu, the leader of the group, who quickly turned on his fellows and began working for the bureau. That led to several arrests in early 2012, including Ackroyd and Davis. Monsegur has not yet been sentenced for his role in the crimes.